Common across human history is our longing to better understand the world we live in, and how it works. But how much can we actually know about the world? In his book, The Island of Knowledge: The Limits of Science and the Search for Meaning, Physicist Marcelo Gleiser traces our progress of modern science in the pursuit to the most fundamental questions on existence, the origin of the universe, and the limits of knowledge. What we know of the world is limited by what we can see and what we can describe, but our tools have evolved over the years to reveal ever more pleats into our fabric of knowledge. Gleiser celebrates this persistent struggle to understand our place in the world and travels our history from ancient knowledge to our current understanding. To move forward, science needs to fail, which runs counter to our human desire for certainty. “We are surrounded by horizons, by incompleteness.” Rather than give up, we struggle along a scale of progress. What makes us human is this journey to understand more about the mysteries of the world and explain them with reason. This is the core of our nature. While the pursuit is never ending, the curious journey offers insight not just into the natural world, but insight into ourselves. We tend to think that what we see is all there is — that there is nothing we cannot see. We know it isn’t true when we stop and think, yet we still get lulled into a trap of omniscience. Science is thus limited, offering only part of the story — the part we can see and measure. The other part remains beyond our immediate reach. There is much that is invisible to the eye, even when we augment our sensorial perception with telescopes, microscopes, and other tools of exploration. Like our senses, every instrument has a range. Because much of Nature remains hidden from us, our view of the world is based only on the fraction of reality that we can measure and analyze. Science, as our narrative describing what we see and what we conjecture exists in the natural world, is thus necessarily limited, telling only part of the story. … We strive toward knowledge, always more knowledge, but must understand that we are, and will remain, surrounded by mystery. This view is neither antiscientific nor defeatist. … Quite the contrary, it is the flirting with this mystery, the urge to go beyond the boundaries of the known, that feeds our creative impulse, that makes us want to know more. My perception of the world around me, as cognitive neuroscience teaches us, is synthesized within different regions of my brain. What I call reality results from the integrated sum of countless stimuli collected through my five senses, brought from the outside into my head via my nervous system. Cognition, the awareness of being here now, is a fabrication of a vast set of chemicals flowing through myriad synaptic connections between my neurons. … We have little understanding as to how exactly this neuronal choreography engenders us with a sense of being. We go on with our everyday activities convinced that we can separate ourselves from our surroundings and construct an objective view of reality. The brain is a great filtering tool, deaf and blind to vast amounts of information around us that offer no evolutionary advantage. Part of it we can see and simply ignore. Other parts, like dust particles and bacteria, go unseen because of limitations of our sensory tools. As the Fox said to the Little Prince in Antoine de Saint-Exupery’s fable, “What is essential is invisible to the eye.” There is no better example than oxygen. Science has increased our view. Our measurement tools and instruments can see bacteria and radiation, subatomic particles and more. However precise these tools have become, their view is still limited. We see much more than Galileo, but we can’t see it all. And this restriction is not limited to measurements: speculative theories and models that extrapolate into unknown realms of physical reality must also rely on current knowledge. When there is no data to guide intuition, scientists impose a “compatibility” criterion: any new theory attempting to extrapolate beyond tested ground should, in the proper limit, reproduce current knowledge. We thus must ask whether grasping reality’s most fundamental nature is just a matter of pushing the limits of science or whether we are being quite naive about what science can and can’t do. Here is another way of thinking about this: if someone perceives the world through her senses only (as most people do), and another amplifies her perception through the use of instrumentation, who can legitimately claim to have a truer sense of reality? One “sees” microscopic bacteria, faraway galaxies, and subatomic particles, while the other is completely blind to such entities. Clearly they “see” different things and—if they take what they see literally—will conclude that the world, or at least the nature of physical reality, is very different. Asking who is right misses the point, although surely the person using tools can see further into the nature of things. Indeed, to see more clearly what makes up the world and, in the process to make more sense of it and ourselves is the main motivation to push the boundaries of knowledge. … What we call “real” is contingent on how deeply we are able to probe reality. Even if there is such thing as the true or ultimate nature of reality, all we have is what we can know of it. Our perception of what is real evolves with the instruments we use to probe Nature. Gradually, some of what was unknown becomes known. For this reason, what we call “reality” is always changing. … The version of reality we might call “true” at one time will not remain true at another. … Given that our instruments will always evolve, tomorrow’s reality will necessarily include entitles not known to exist today. … More to the point, as long as technology advances—and there is no reason to suppose that it will ever stop advancing for as long as we are around—we cannot foresee an end to this quest. The ultimate truth is elusive, a phantom. Gleiser makes his point with a beautiful metaphor. The Island of Knowledge. Consider, then, the sum total of our accumulated knowledge as constituting an island, which I call the “Island of Knowledge.” … A vast ocean surrounds the Island of Knowledge, the unexplored ocean of the unknown, hiding countless tantalizing mysteries. Learning more about the world doesn’t lead to a point closer to a final destination—whose existence is nothing but a hopeful assumption anyways—but to more questions and mysteries. The more we know, the more exposed we are to our ignorance, and the more we know to ask. Richard Feynman has pointed out before that science can only answer the subset of question that go, roughly, “If I do this, what will happen?” Answers to questions like Why do the rules operate that way? and Should I do it? are not really questions of scientific nature — they are moral, human questions, if they are knowable at all. The Island of Knowledge is a wide-ranging tour through scientific history from planetary motions to modern scientific theories and how they affect our ideas on what is knowable. We’ve covered the brilliant physicist Richard Feynman (1918-1988) many times here before. He was a genius. A true genius. But there have been many geniuses — physics has been fortunate to attract some of them — and few of them are as well known as Feynman. Why is Feynman so well known? It’s likely because he had tremendous range outside of pure science, and although he won a Nobel Prize for his work in quantum mechanics, he’s probably best known for other things, primarily his wonderful ability to explain and teach. This ability was on display in a series of non-technical lectures in 1963, memorialized in a short book called The Meaning of it All: Thoughts of a Citizen Scientist. The lectures are a wonderful example of how well Feynman’s brain worked outside of physics, talking through basic reasoning and some of the problems of his day. Particularly useful are a series of “tricks of the trade” he gives in a section called This Unscientific Age. 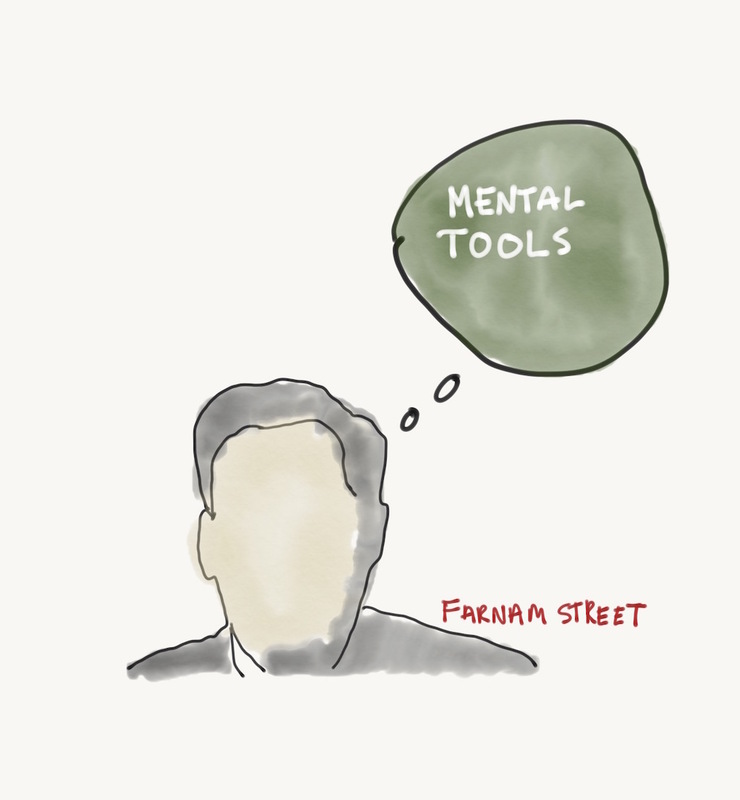 These tricks show Feynman taking the method of thought he learned in pure science and applying it to the more mundane topics most of us have to deal with every day. They’re wonderfully instructive. Let’s check them out. Now, that there are unscientific things is not my grief. That’s a nice word. I mean, that is not what I am worrying about, that there are unscientific things. That something is unscientific is not bad; there is nothing the matter with it. It is just unscientific. And scientific is limited, of course, to those things that we can tell about by trial and error. For example, there is the absurdity of the young these days chanting things about purple people eaters and hound dogs, something that we cannot criticize at all if we belong to the old flat foot floogie and a floy floy or the music goes down and around. Sons of mothers who sang about “come, Josephine, in my flying machine,” which sounds just about as modern as “I’d like to get you on a slow boat to China.” So in life, in gaiety, in emotion, in human pleasures and pursuits, and in literature and so on, there is no need to be scientific, there is no reason to be scientific. One must relax and enjoy life. That is not the criticism. That is not the point. The first one has to do with whether a man knows what he is talking about, whether what he says has some basis or not. And my trick that I use is very easy. If you ask him intelligent questions—that is, penetrating, interested, honest, frank, direct questions on the subject, and no trick questions—then he quickly gets stuck. It is like a child asking naive questions. If you ask naive but relevant questions, then almost immediately the person doesn’t know the answer, if he is an honest man. It is important to appreciate that. And I think that I can illustrate one unscientific aspect of the world which would be probably very much better if it were more scientific. It has to do with politics. Suppose two politicians are running for president, and one goes through the farm section and is asked, “What are you going to do about the farm question?” And he knows right away— bang, bang, bang. Now he goes to the next campaigner who comes through. “What are you going to do about the farm problem?” “Well, I don’t know. I used to be a general, and I don’t know anything about farming. But it seems to me it must be a very difficult problem, because for twelve, fifteen, twenty years people have been struggling with it, and people say that they know how to solve the farm problem. And it must be a hard problem. So the way that I intend to solve the farm problem is to gather around me a lot of people who know something about it, to look at all the experience that we have had with this problem before, to take a certain amount of time at it, and then to come to some conclusion in a reasonable way about it. Now, I can’t tell you ahead of time what conclusion, but I can give you some of the principles I’ll try to use—not to make things difficult for individual farmers, if there are any special problems we will have to have some way to take care of them,” etc., etc., etc. That’s a wonderfully useful way to figure out whether someone is Max Planck or the chauffeur. People say to me, “Well, how can you teach your children what is right and wrong if you don’t know?” Because I’m pretty sure of what’s right and wrong. I’m not absolutely sure; some experiences may change my mind. But I know what I would expect to teach them. But, of course, a child won’t learn what you teach him. I would like to mention a somewhat technical idea, but it’s the way, you see, we have to understand how to handle uncertainty. How does something move from being almost certainly false to being almost certainly true? How does experience change? How do you handle the changes of your certainty with experience? And it’s rather complicated, technically, but I’ll give a rather simple, idealized example. You have, we suppose, two theories about the way something is going to happen, which I will call “Theory A” and “Theory B.” Now it gets complicated. Theory A and Theory B. Before you make any observations, for some reason or other, that is, your past experiences and other observations and intuition and so on, suppose that you are very much more certain of Theory A than of Theory B—much more sure. But suppose that the thing that you are going to observe is a test. According to Theory A, nothing should happen. According to Theory B, it should turn blue. Well, you make the observation, and it turns sort of a greenish. Then you look at Theory A, and you say, “It’s very unlikely,” and you turn to Theory B, and you say, “Well, it should have turned sort of blue, but it wasn’t impossible that it should turn sort of greenish color.” So the result of this observation, then, is that Theory A is getting weaker, and Theory B is getting stronger. And if you continue to make more tests, then the odds on Theory B increase. Incidentally, it is not right to simply repeat the same test over and over and over and over, no matter how many times you look and it still looks greenish, you haven’t made up your mind yet. But if you find a whole lot of other things that distinguish Theory A from Theory B that are different, then by accumulating a large number of these, the odds on Theory B increase. Feynman is talking about Grey Thinking here, the ability to put things on a gradient from “probably true” to “probably false” and how we deal with that uncertainty. He isn’t proposing a method of figuring out absolute, doctrinaire truth. Another term for what he’s proposing is Bayesian updating — starting with a priori odds, based on earlier understanding, and “updating” the odds of something based on what you learn thereafter. An extremely useful tool. I give an example. A professor, I think somewhere in Virginia, has done a lot of experiments for a number of years on the subject of mental telepathy, the same kind of stuff as mind reading. In his early experiments the game was to have a set of cards with various designs on them (you probably know all this, because they sold the cards and people used to play this game), and you would guess whether it’s a circle or a triangle and so on while someone else was thinking about it. You would sit and not see the card, and he would see the card and think about the card and you’d guess what it was. And in the beginning of these researches, he found very remarkable effects. He found people who would guess ten to fifteen of the cards correctly, when it should be on the average only five. More even than that. There were some who would come very close to a hundred percent in going through all the cards. Excellent mind readers. A number of people pointed out a set of criticisms. One thing, for example, is that he didn’t count all the cases that didn’t work. And he just took the few that did, and then you can’t do statistics anymore. And then there were a large number of apparent clues by which signals inadvertently, or advertently, were being transmitted from one to the other. Various criticisms of the techniques and the statistical methods were made by people. The technique was therefore improved. The result was that, although five cards should be the average, it averaged about six and a half cards over a large number of tests. Never did he get anything like ten or fifteen or twenty-five cards. Therefore, the phenomenon is that the first experiments are wrong. The second experiments proved that the phenomenon observed in the first experiment was nonexistent. The fact that we have six and a half instead of five on the average now brings up a new possibility, that there is such a thing as mental telepathy, but at a much lower level. It’s a different idea, because, if the thing was really there before, having improved the methods of experiment, the phenomenon would still be there. It would still be fifteen cards. Why is it down to six and a half? Because the technique improved. Now it still is that the six and a half is a little bit higher than the average of statistics, and various people criticized it more subtly and noticed a couple of other slight effects which might account for the results. It turned out that people would get tired during the tests, according to the professor. The evidence showed that they were getting a little bit lower on the average number of agreements. Well, if you take out the cases that are low, the laws of statistics don’t work, and the average is a little higher than the five, and so on. So if the man was tired, the last two or three were thrown away. Things of this nature were improved still further. The results were that mental telepathy still exists, but this time at 5.1 on the average, and therefore all the experiments which indicated 6.5 were false. Now what about the five? . . . Well, we can go on forever, but the point is that there are always errors in experiments that are subtle and unknown. But the reason that I do not believe that the researchers in mental telepathy have led to a demonstration of its existence is that as the techniques were improved, the phenomenon got weaker. In short, the later experiments in every case disproved all the results of the former experiments. If remembered that way, then you can appreciate the situation. This echoes Feyman’s dictum about not fooling oneself: We must refine our process for probing and experimenting if we’re to get at real truth, always watching out for little troubles. Otherwise, we torture the world so that results fit our expectations. If we carefully refine and re-test and the effect gets weaker all the time, it’s likely to not be true, or at least not to the magnitude originally hoped for. That brings me to the fourth kind of attitude toward ideas, and that is that the problem is not what is possible. That’s not the problem. The problem is what is probable, what is happening. It does no good to demonstrate again and again that you can’t disprove that this could be a flying saucer. We have to guess ahead of time whether we have to worry about the Martian invasion. We have to make a judgment about whether it is a flying saucer, whether it’s reasonable, whether it’s likely. And we do that on the basis of a lot more experience than whether it’s just possible, because the number of things that are possible is not fully appreciated by the average individual. And it is also not clear, then, to them how many things that are possible must not be happening. That it’s impossible that everything that is possible is happening. And there is too much variety, so most likely anything that you think of that is possible isn’t true. In fact that’s a general principle in physics theories: no matter what a guy thinks of, it’s almost always false. So there have been five or ten theories that have been right in the history of physics, and those are the ones we want. But that doesn’t mean that everything’s false. We’ll find out. I now turn to another kind of principle or idea, and that is that there is no sense in calculating the probability or the chance that something happens after it happens. A lot of scientists don’t even appreciate this. In fact, the first time I got into an argument over this was when I was a graduate student at Princeton, and there was a guy in the psychology department who was running rat races. I mean, he has a T-shaped thing, and the rats go, and they go to the right, and the left, and so on. And it’s a general principle of psychologists that in these tests they arrange so that the odds that the things that happen happen by chance is small, in fact, less than one in twenty. That means that one in twenty of their laws is probably wrong. But the statistical ways of calculating the odds, like coin flipping if the rats were to go randomly right and left, are easy to work out. For example, I had the most remarkable experience this evening. While coming in here, I saw license plate ANZ 912. Calculate for me, please, the odds that of all the license plates in the state of Washington I should happen to see ANZ 912. Well, it’s a ridiculous thing. And, in the same way, what he must do is this: The fact that the rat directions alternate suggests the possibility that rats alternate. If he wants to test this hypothesis, one in twenty, he cannot do it from the same data that gave him the clue. He must do another experiment all over again and then see if they alternate. He did, and it didn’t work. The next kind of technique that’s involved is statistical sampling. I referred to that idea when I said they tried to arrange things so that they had one in twenty odds. The whole subject of statistical sampling is somewhat mathematical, and I won’t go into the details. The general idea is kind of obvious. If you want to know how many people are taller than six feet tall, then you just pick people out at random, and you see that maybe forty of them are more than six feet so you guess that maybe everybody is. Sounds stupid. Well, it is and it isn’t. If you pick the hundred out by seeing which ones come through a low door, you’re going to get it wrong. If you pick the hundred out by looking at your friends you’ll get it wrong because they’re all in one place in the country. But if you pick out a way that as far as anybody can figure out has no connection with their height at all, then if you find forty out of a hundred, then, in a hundred million there will be more or less forty million. How much more or how much less can be worked out quite accurately. In fact, it turns out that to be more or less correct to 1 percent, you have to have 10,000 samples. People don’t realize how difficult it is to get the accuracy high. For only 1 or 2 percent you need 10,000 tries. Now, looking at the troubles that we have with all the unscientific and peculiar things in the world, there are a number of them which cannot be associated with difficulties in how to think, I think, but are just due to some lack of information. In particular, there are believers in astrology, of which, no doubt, there are a number here. Astrologists say that there are days when it’s better to go to the dentist than other days. There are days when it’s better to fly in an airplane, for you, if you are born on such a day and such and such an hour. And it’s all calculated by very careful rules in terms of the position of the stars. If it were true it would be very interesting. Insurance people would be very interested to change the insurance rates on people if they follow the astrological rules, because they have a better chance when they are in the airplane. Tests to determine whether people who go on the day that they are not supposed to go are worse off or not have never been made by the astrologers. The question of whether it’s a good day for business or a bad day for business has never been established. Now what of it? Maybe it’s still true, yes. On the other hand, there’s an awful lot of information that indicates that it isn’t true. Because we have a lot of knowledge about how things work, what people are, what the world is, what those stars are, what the planets are that you are looking at, what makes them go around more or less, where they’re going to be in the next 2000 years is completely known. They don’t have to look up to find out where it is. And furthermore, if you look very carefully at the different astrologers they don’t agree with each other, so what are you going to do? Disbelieve it. There’s no evidence at all for it. It’s pure nonsense. The only way you can believe it is to have a general lack of information about the stars and the world and what the rest of the things look like. If such a phenomenon existed it would be most remarkable, in the face of all the other phenomena that exist, and unless someone can demonstrate it to you with a real experiment, with a real test, took people who believe and people who didn’t believe and made a test, and so on, then there’s no point in listening to them. Still Interested? Check out the (short) book: The Meaning of it All: Thoughts of a Citizen-Scientist. Legendary scientist Richard Feynman (1918-1988) was famous for his penetrating insight and clarity of thought. Famous for not only the work he did to garner a Nobel Prize, but also for the lucidity of explanations of ordinary things such as why trains stay on the tracks as they go around a curve, how we look for new laws of science, how rubber bands work, and . Traditionally this commissionership was a sinecure that brought various small perquisites under the table from textbook publishers. Few commissioners— as Feynman discovered— read many textbooks, but he determined to read them all, and had scores of them delivered to his house. This was the era of new math in children’s textbooks: introducing high-level concepts, such as set theory and non decimal number systems into grade school. Feynman was skeptical of this approach but rather than simply let it go, he popped the balloon. He argued to his fellow commissioners that sets, as presented in the reformers’ textbooks, were an example of the most insidious pedantry: new definitions for the sake of definition, a perfect case of introducing words without introducing ideas. It is an example of the use of words, new definitions of new words, but in this particular case a most extreme example because no facts whatever are given…. It will perhaps surprise most people who have studied this textbook to discover that the symbol ∪ or ∩ representing union and intersection of sets … all the elaborate notation for sets that is given in these books, almost never appear in any writings in theoretical physics, in engineering, business, arithmetic, computer design, or other places where mathematics is being used. As a matter of fact, it is impossible to be precise … whereas before there was no difficulty. The picture of a ball includes a circle and includes a background. Should we color the entire square area in which the ball image appears all red? … Precision has only been pedantically increased in one particular corner when there was originally no doubt and no difficulty in the idea. In the real world absolute precision can never be reached and the search for degrees of precision that are not possible (but are desirable) causes a lot of folly. Feynman has his own ideas for teaching children mathematics. Feynman proposed that first-graders learn to add and subtract more or less the way he worked out complicated integrals— free to select any method that seems suitable for the problem at hand.A modern-sounding notion was, The answer isn’t what matters, so long as you use the right method. To Feynman no educational philosophy could have been more wrong. The answer is all that does matter, he said. He listed some of the techniques available to a child making the transition from being able to count to being able to add. A child can combine two groups into one and simply count the combined group: to add 5 ducks and 3 ducks, one counts 8 ducks. The child can use fingers or count mentally: 6, 7, 8. One can memorize the standard combinations. Larger numbers can be handled by making piles— one groups pennies into fives, for example— and counting the piles. One can mark numbers on a line and count off the spaces— a method that becomes useful, Feynman noted, in understanding measurement and fractions. One can write larger numbers in columns and carry sums larger than 10.
was considered a third-grade problem because it involved the concept of carrying. However, Feynman pointed out most first-graders could easily solve this problem by counting 30, 31, 32. He proposed that kids be given simple algebra problems (2 times what plus 3 is 7) and be encouraged to solve them through the scientific method, which is tantamount to trial and error. This, he argued, is what real scientists do. It was better in the end to have a bag of tricks at your disposal that could be used to solve problems than one orthodox method. Indeed, part of Feynman’s genius was his ability to solve problems that were baffling others because they were using the standard method to try and solve them. He would come along and approach the problem with a different tool, which often led to simple and beautiful solutions. 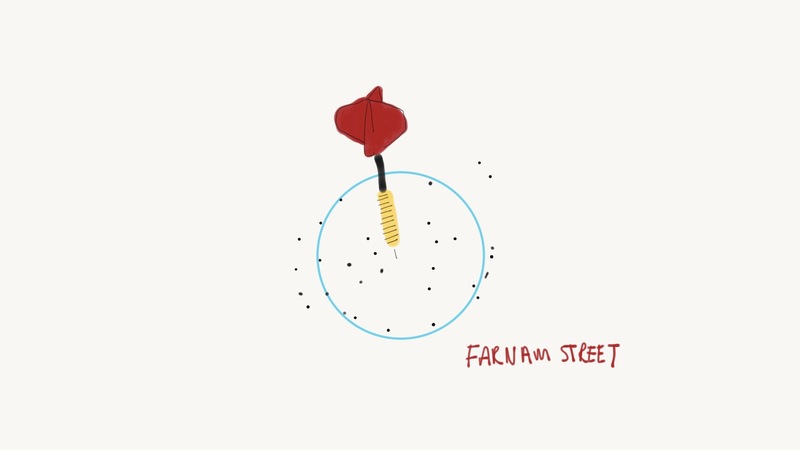 If you give some thought to how Farnam Street helps you, one of the ways is by adding to your bag of tricks so that you can pull them out when you need them to solve problems. We call these tricks mental models and they work kinda like lego — interconnecting and reinforcing one another. The more pieces you have, the more things you can build. 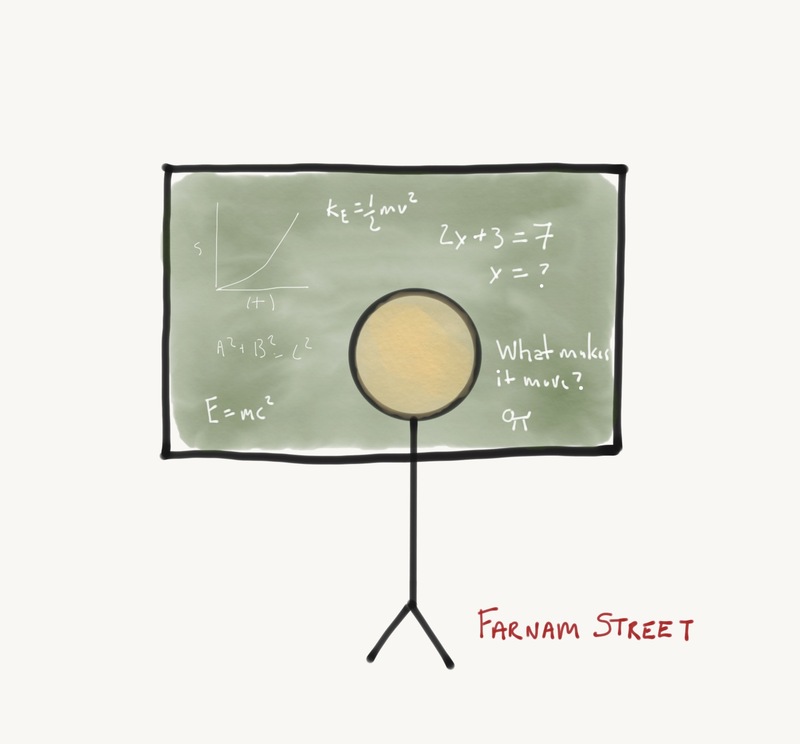 Complement this post with Feynman’s excellent advice on how to learn anything. Gawande addresses the current growing mistrust of “scientific authority” — the thought that because science creaks along one mistake at a time, that it isn’t to be trusted. The misunderstanding of what scientific thinking is and how it works is at the root of much problematic ideology, and it’s up to those who do understand it to promote its virtues. It’s important to realize that scientists, singular, are as fallible as the rest of us. Thinking otherwise only sets you up for a disappointment. The point of science is the collective, the forward advance of the hive, not the bee. It’s sort of a sausage-making factory when seen up close, but when you pull back the view, it looks like a beautifully humming engine, steadily giving us more and more information about ourselves and the world around us. Science is, above all, a method of thought. A way of figuring out what’s true and what we’re just fooling ourselves about. He echoes Steven Pinker in the thought that science, traditionally left to the realm of discovering “physical” reality, is now making great inroads into what might have previously been considered philosophy, by exploring why and how our minds work the way they do. This can only be accomplished by deep critical thinking across a broad range of disciplines, and by the dual attack of specialists uncovering highly specific nuggets and great synthesizers able to suss out meaning from the big pile of facts. Last year, the wonderful Gary Taubes, whose ideas about nutrition we have written about before, gave a commencement address to the students of the Schmid College of Science and Technology at Chapman University in California. The address is near and dear to our way of thinking, because Taubes raises a difficult and correct truth: In order to pursue new knowledge of the world, we must be confident that our ideas are correct, but because we are very susceptible to fooling ourselves, this tendency will lead us to believe lots of untruth as well. He calls it a tightrope walk: The thin line between being confident in an unpopular or yet unknown piece of knowledge and being a fool who buys into his cherished untruths. Part of the speech is reprinted below, but be sure to check the whole thing out. Now here’s the catch: In science, as in life, you have to have faith in yourself and your ideas. You have to make decisions about what you’ll pursue, what you’ll continue pursuing despite times getting very tough, who you’ll do it with, who you’ll stay doing it with even after times get tough, where you’ll do it; why other people should do it with you and keep doing it with you through the tough times. You’ll make these decisions based on the assumption that what you believe is true really is. Without this belief we don’t do anything; it’s what drives us forward and allows us to act decisively. But if we fool ourselves, and we’re the easiest person to fool, we’ll make the wrong decisions – as individuals, as a society. Still Interested? Check out a few other great commencement speeches or read up on Gary Taubes’ thoughts on Why we Get Fat.